We just acquired a parcel with THOUSANDS of opals! These Opal Doublets have very bright colors including reds, blues, greens, pinks, yellows, and even some orange. It would take far too much time to sell each of these opals individually so we have decided to divide them into random lots of 5 opals each. That's less than $5 per opal which is quite a bargain for opals of this high quality. Each lot will contain 5 opal pieces ranging in size from 7mm x 4mm up to 20mm x 10mm. 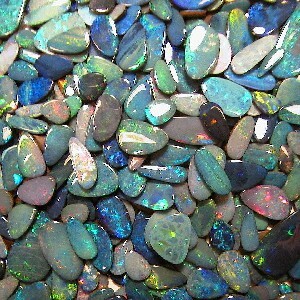 These opals are unsearched, unsorted, and straight from Australia. These beautiful pieces are not cherry picked; they come to you as they came to us. These freeform Black Opal doublets contain exquisite multi-colors, ranging from Fiery Reds to Intense Magentas to Ocean Blues, to just about every other color in the Rainbow. These top quality opals were mined at Lightning Ridge in Australia, and they are set on ironstone backing. There are only a limited quantity of these collector stones available, but we will continue to offer them while they last. Collectors who are used to paying much more than this will agree that this will not last long. If you are a gem lover, collector, treasure hunter, or anyone who appreciates a really great deal then this is an opportunity that should not be passed up! If prior demand is any indication, this lot will not last long so get them while they last. What an Incredible Gift Idea!!! If you've ever seen the prices of opals in a jewelry shop, then you know what an amazing bargain this is! These top quality opals will be great for necklaces, earrings, pendants, rings, and would make a perfect gift, either for a special someone else or for yourself!